first bloom. lots of potential. cell phone pic. that is nice one-- can tell that the color is really saturated. and i like the contrast. how big is the bloom? i was surprised when i saw gosh in bloom at frank's. But I hope that we will see more flowers where there are good traits from Brother Ambo Passion. Love the clarity of color. "that is nice one-- can tell that the color is really saturated. and i like the contrast. how big is the bloom? i was surprised when i saw gosh in bloom at frank's." How I miss that one ? I somehow ended up with 1 gorgeous seedling from this cross, although i thought I had more. It is a beautiful seedling in spike/bud. 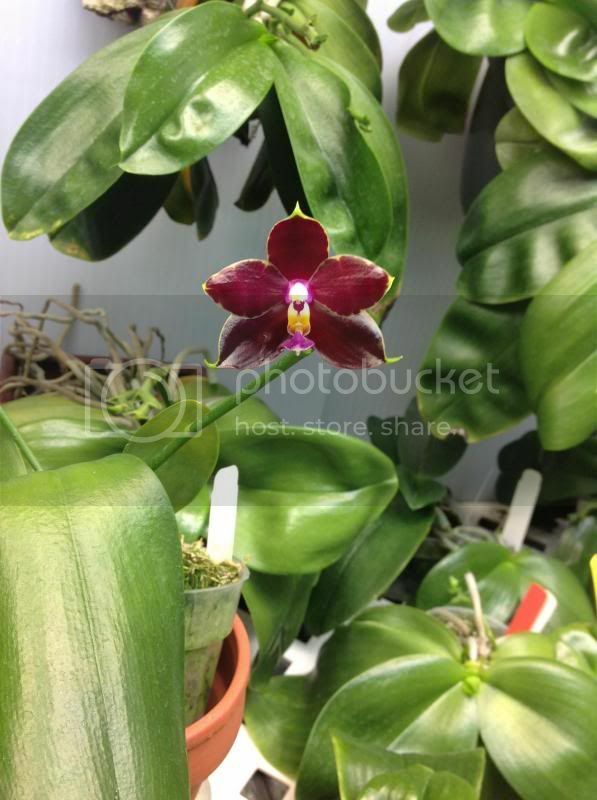 The bud appears to be solid reddish/purple and I had hoped it would pop in time to go in to our orchid show this weekend. Problem is, I need it to open by Thursday around lunch. So, i've got 48 hours if this is to be seen at our show. Not looking promising. I thought it would be fun to register this in the "first bloom seedling" class. Mike, you can speed up opening of the flower by giving this plant more light without increasing the temperature significantly. Too much light and too warm could cause bud drop. Yes indeed Peter, the plant was moved and raised to be positioned directly, yet safely, under my lights. I am hopeful it's one of those flowers that pops open quickly, once it cracks. LDBK 'RK-1' for example is the slowest growing buds to open I think i've ever observed on a phal. Well, this one is sweet for a first bloom. If you disregard the flaw in the bud, this flower is awesome. Great work Peter. Wow. Just wow. Great pick of the lot Mike. And nice work to Peter as well. I saw this one in person. It has great color and a nice pattern.